Margarete Lamb-Faffelberger, Professor of German and Director of the Max Kade Center for German Studies, and Gabriele Petricek, Austrian writer, are both members of the Austrian writers’ association PODIUM. 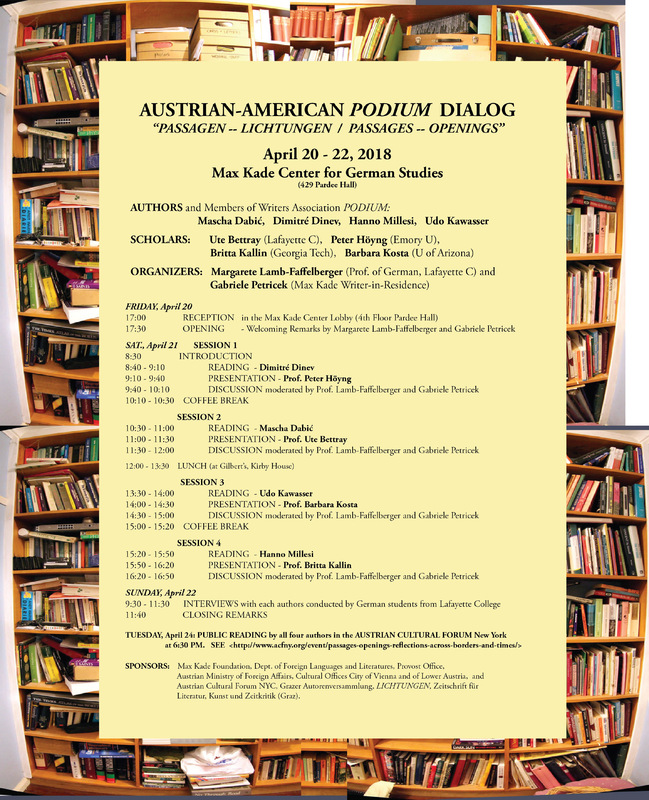 Together, they developed the concept for the Austrian-American PODIUM Dialog that brings together four Austrian writers with four German Studies scholars. Each scholar, assigned to an author, offers a presentation that follows the reading by the author. On the second day of the symposium, Lafayette students, who study each author’s texts in their German literature seminar, lead group discussions with the authors and the scholars. The students are always a surprise: highly motivated and impressively well read in the works of the four invited authors. 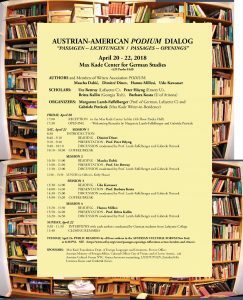 The general motto of the Austrian-American PODIUM Dialog is “Passages” with different subtitles for each symposium: “Crossings“ in 2013, “Borders“ in 2015, and “Openings“ in 2018.